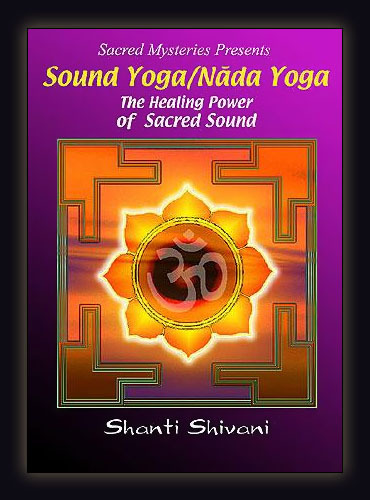 In this beautiful and enlightening presentation, internationally acclaimed teacher, vocalist and sound healer Shanti Shivani introduces the mystic practice of Nada Yoga (the Yoga of Sound) as a means of healing, empowerment and self-realization. Nada Yoga is the core of Dhrupad, the most ancient style of Hindustani Classical Music. Originally only sung by priests in the temples as an act of worship, it induces a deep meditative state in the singer as well as the listener. Drawing upon her extensive training and experience in the Dhrupad tradition, Shivani presents specific body movements and vocal techniques designed to free the natural voice, develop awareness of the breath and body, stimulate the innate healing potential and access the sacred within. She also offers instruction in the basic vocal exercises of the ancient Indian raga (modal) system and more specifically in Raga Bhairav, the ‘sunrise mode’ that invokes the state of inner peace. These time-honored techniques are designed to clear the emotional body, balance the chakras (subtle energy centers), enhance intuition a nd creative expression, harmonize body, mind and soul and bring a new level of inner peace, health and harmony. "The DVD is gorgeous, gorgeous, gorgeous! The whole thing is excellently put together. You look wonderful, a master of your art, and the teaching is top notch, clear, the whole presentation smooth. The set is lovely, and I liked the way the colors of the cloud sequences contrasted with the flame colors of the set. Well done!" "Nada Yoga, the yoga of sound, is a powerful method of using sound and voice as a tool for healing. The practice lies at the core of the Dhrupad (Hindustani musical tradition). At one time, only temple priests were allowed to sing these ragas. With this DVD recording, vocalist and sound healer Shanti Shivani presents an introduction to this sacred form of yoga and its therapeutic potential. The program covers basis vocal exercises of the Indian raga, body movements and vocal techniques designed to free the natural voice, a “ sunrise mode ”that evokes inner peace and much more. Practicing Nada Yoga can be beneficial in helping one release emotion, de-stress, balance the chakras, and promote creativity." "In this program, rare and respected Western and female authority Shanti Shivani presents some fundamentals of Nada Yoga, the Sound Yoga from the Hindu or Vedic tradition. Shivani reminds us that Greek musicology is suspected to have come from Indian music culture. This fact, and the experience of participating in the simple and powerful principles, toning, and ragas she presents, generate a powerful felt sense of the universality, profound creativity and transformational potential of sound, when generated and sculpted with mindfulness and pureness of heart. Shivani, adorned in a yellow sari, sits with radiant grace and gentle authority amid a sumptuously dressed set and guides us through exercises of increasing complexity, doing so with pacing and repetition sufficient to promote quite a stirring personal experience. This is just a taste and yet it feels like a substantial immersion into a marvelous, mystical, nearly forgotten world. The presentation both whets the appetite for more and makes clear that even these few offerings warrant time, respect and surrender to fully explore and master." "Your Nada Yoga DVD is an incredible gift, pure magic. You present the practices at a pace that are clear and easy to follow, with the key being to relax into each movement, breath and vocalization. After only a week of daily practice I can tell the difference in how my energies are balanced and harmonized. Working with the rise of kundalini and the nadam's inner vibration can be tricky so I really do appreciate how profoundly helpful your sharing of the Dhrupad nada yoga tradition is."